Bottleneck operations is a common scenario in most steel manufacturing plants. It can cause delays in operations, which may result in not meeting target production yield. However, installing industrial PCs can make a steel process become seamless. It enhances the overall steel operation when these panel PCs are embedded in ruggedised industrial workstations. This type of setup allows operators to have an easy access to the data input and computing functions. As a result, the information, data and monitoring tasks are streamlined which increases production, ROI and overall performance. 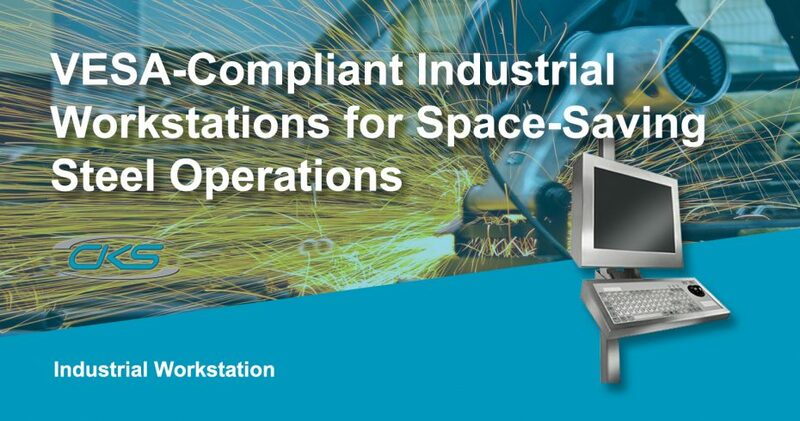 But, why opt for a VESA-compliant industrial workstation in steel operations? Understand more of its features in this blog and get to know how it can improve the operation workflow in steel processes. Automation is the most used technology, especially in manufacturing industries. That is why steel producers also take advantage of this technology. By installing an automated software in panel PCs, it can significantly increase production rate in a streamlined and dynamic process. But, these computing systems are usually located on the production floor where it also bears a fast-paced environment. So, to meet this challenge, attaching these devices to a VESA-ready ruggedised workstation can bring most operational necessities at the core of production. This ergonomic structure can improve an operator’s ability to perform a task since it allows less exertion and better height reaches. Moreover, industrial-grade workstations have high IP/NEMA ratings to meet the sturdiness necessary to last in the harsh environment of steel production. Even under the presence of dirt, dust, extreme temperature, shock and vibration, the equipment will not be easily damaged. So, the succeeding section will enumerate the factors and specifications of industrial workstations that is ideal for steel operations. Having a computer installed on robust workstations is essential to promote an ergonomic work environment. Here are three factors of an ideal industrial workstation fit for steel manufacturing operations. Equipment in steel production must meet the IP/NEMA rating standard to ensure that it can withstand potential risks. But, these industrial workstations can have an IP65/NEMA 4 rating. So, expect that operators can continuously use panel PCs in an ergonomic manner despite the presence of these elements can cause risks to the system. Having a seamless execution of operations is a crucial factor for a dynamic steel production. So, choosing a rugged workstation with VESA wall-mount support can help in saving workspace. Panel PCs and its peripherals can also be installed in this small footprint so necessary computing and data encoding functions are easy to access. Therefore, it offers a clutter-free production floor, allowing placement of larger machinery. The steel production floor has several elements that can damage equipment. However, a stainless steel construction protects the device from corrosion and extreme temperature. This is why a workstation that is made out of stainless steel is reliable and durable. It reduces overall liabilities and expenditures of steel manufacturing since this workstation can last over extended periods. Keeping up with the demand for steel is certainly one of the key challenges that the steel industry faces. To further increase the production of steel, embedded computers with automation technology is utilised. But, these computing devices need to be integrated with industrial-grade workstations. That way, it can help centralise all the information and computing functionalities on the production floor. So, opt for a stainless steel ruggedised workstation to create efficient and dynamic steel operations. Contact a trusted industrial computer provider today for further information.